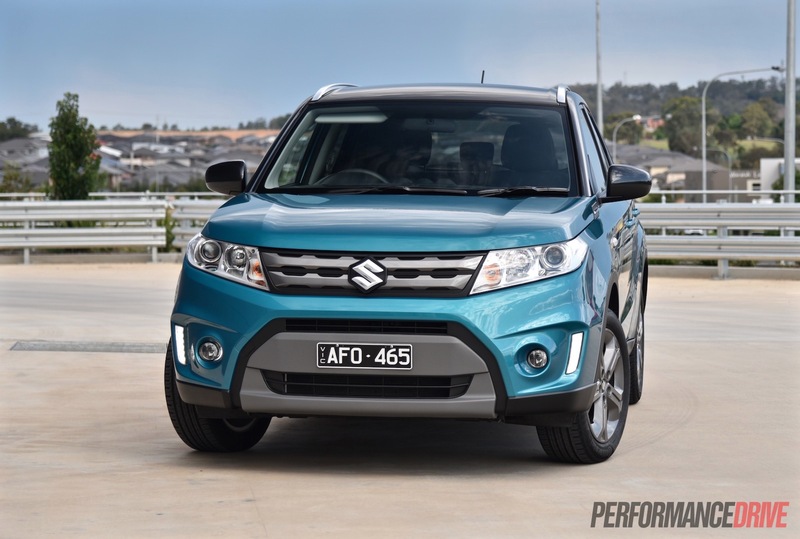 It’s a nameplate that originally helped pioneer what is now one of the fiercest market segments, but can the new Suzuki Vitara fend off the well-packaged and great value rivals? In our opinion the new Vitara has two main rivals that it needs to contend with; the excellent Mazda CX-3, and the great value Honda HR-V. 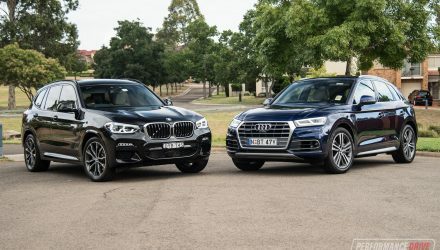 Both of these really do lead the way in the small SUV segment we think, often topping the sales charts, along with the equally-good Mitsubishi ASX. 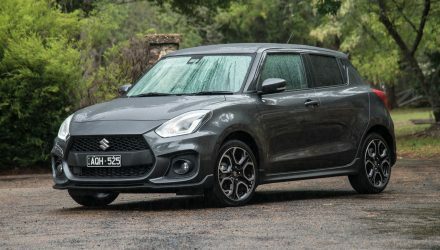 Suzuki Australia offers customers three main variants at the moment, spanning from the front-wheel drive RT-S (as tested), to the range-topping all-wheel drive RT-X. 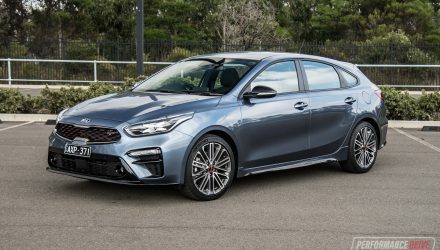 The latter of which will soon be replaced by a new turbo Vitara S. For now, all come with a 1.6-litre naturally aspirated petrol four-cylinder producing a rather puny 86kW and 156Nm. Fortunately, the RT-S is available in both six-speed auto and five-speed manual form. We’re testing both, including taking the auto version for a run from Sydney, up the coast to Port Macquarie and Coffs Harbour. The RT-S is pitched as the volume-seller. 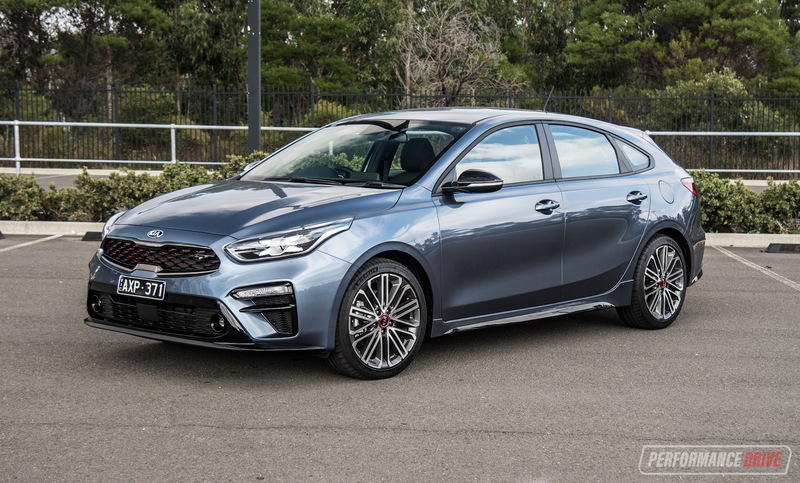 It’s designed to be the most appealing to the broader public, featuring loads of standard goodies while kicking off from just $21,990 for the manual and $23,990 for the auto (excluding on-roads). This makes it easily the most affordable out of our two favourites mentioned above. Does that mean there are sacrifices that you have make? Let’s find out. 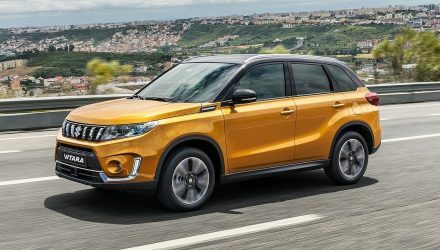 You might have guessed the Vitara has shrunk a bit compared with the more iconic model of the past, but in fact it is only just a smidge smaller than the V6 predecessor. 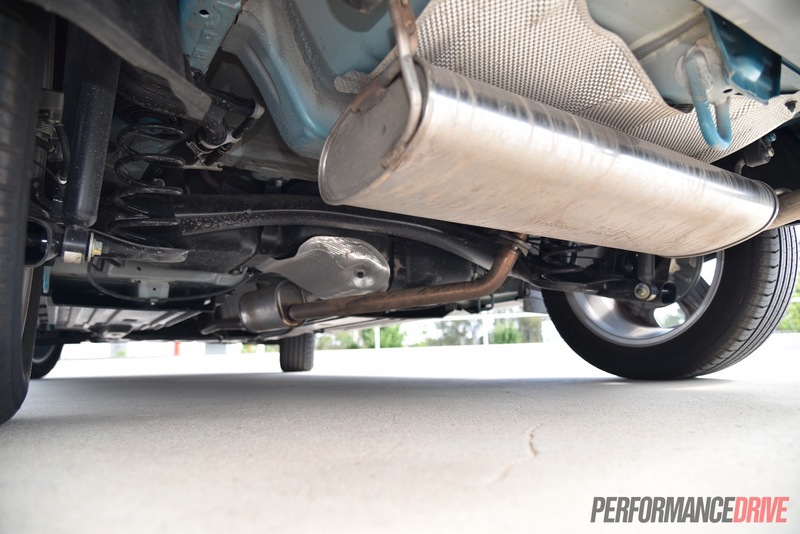 Overall length stands at 4175mm, just shy of 4195mm of the V6 model from the late ’90s, with width dropping from 1780mm to 1775mm here. The overall height is what makes it appear so much smaller, dropping from 1740mm to 1610mm. 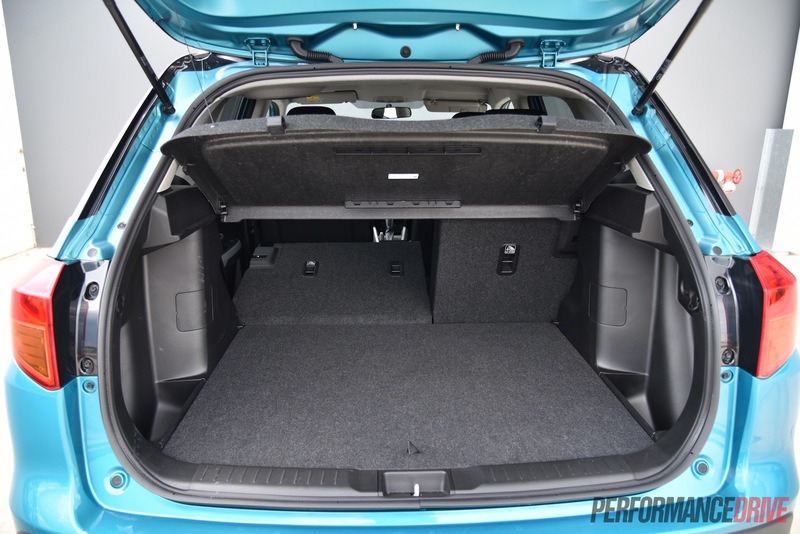 Ground clearance has also dropped, from 201mm to 185mm for this latest model. 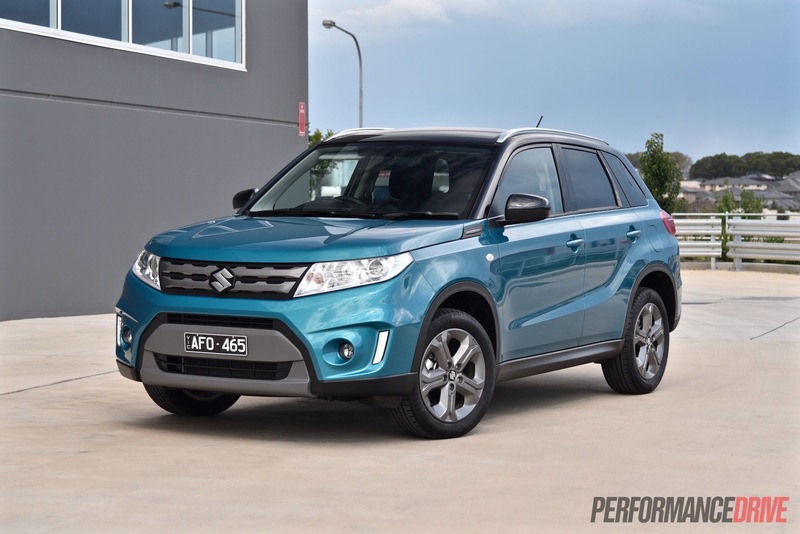 With these new dimensions the 2015-2016 Vitara is clearly more wagon-like as opposed to SUV-like, making it more attractive to adventurous types that also need a vehicle for zipping around the city and suburbs. 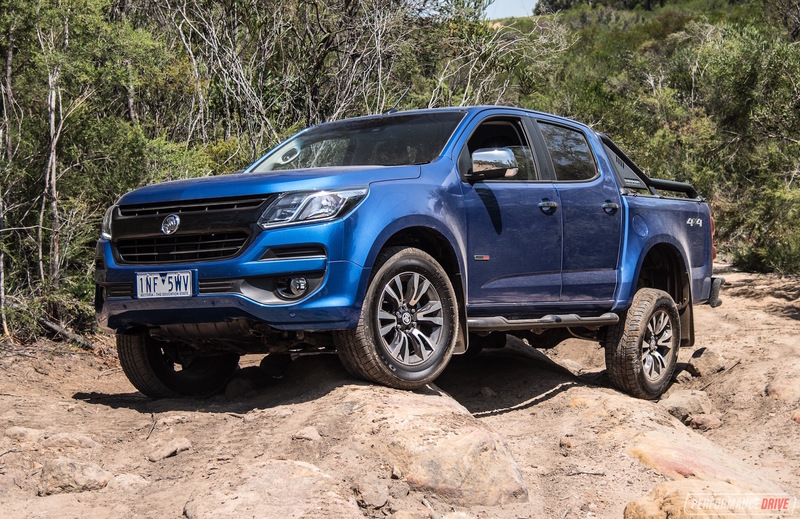 In other words, it’s not designed to be as heavy-duty in the bush. Instead, it’s more practical. In terms of practicality the Vitara RT-S is superb. The seats sit high above the floor in the cabin giving everyone a perched up view through the low window sills. 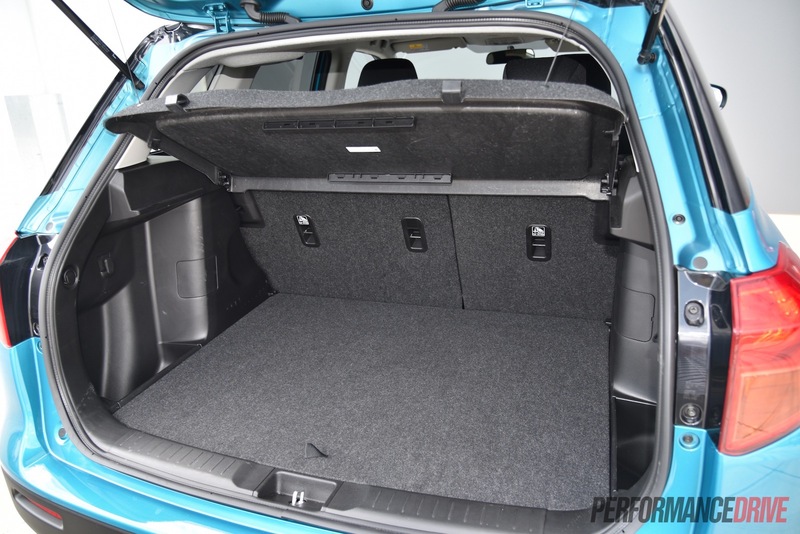 There is plenty of headroom though, especially in the front, and legroom is respectable for the segment, even in the back. 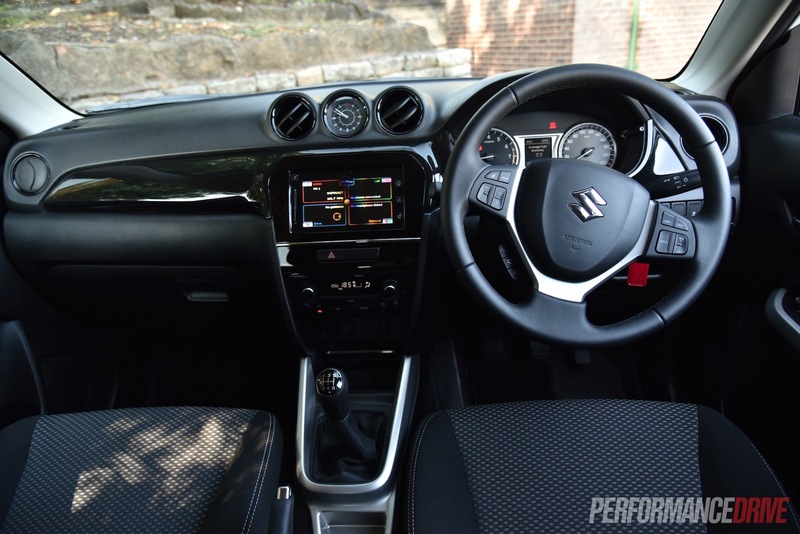 The cabin is quite narrow but Suzuki has cleverly worked in a decent centre console for the front passengers, featuring dual cup holders and some sizeable storage pockets. There are also bottle holders in all four doors. 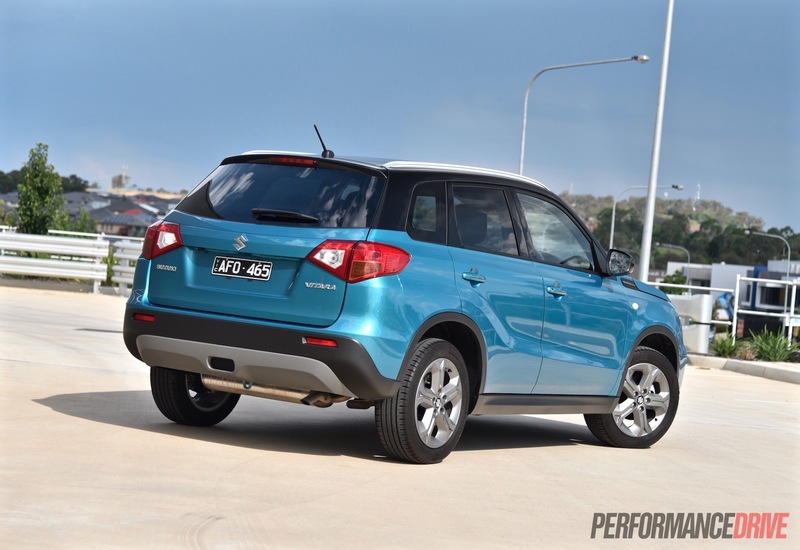 When it comes to packaging and equipment, the Vitara RT-S is the ultimate option. 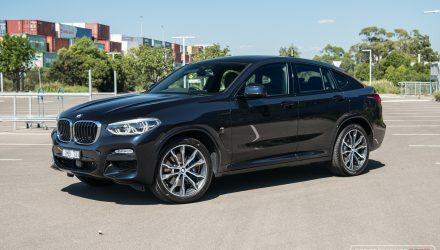 This thing comes with everything, including a nice touch-screen interface system with easy-to-use apps, satellite navigation as standard, and a quality reversing camera. 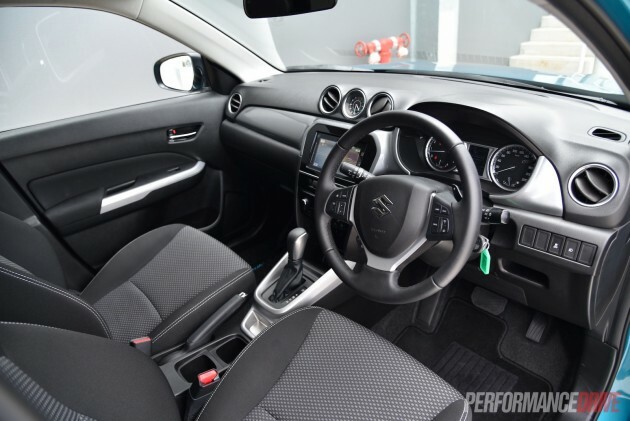 Cruise control is also standard, as are the USB port in the front, two 12V sockets (front and cargo area), digital climate control air-con, factory tinted windows, and Bluetooth with voice recognition. Strangely, auto headlights aren’t available despite the fitment of these similarly advanced items. The only options are metallic paint ($475), and a two-tone black roof theme ($995) as featured on this Atlantic Turquoise auto model. 17-inch alloy wheels are standard across the board, albeit in different designs for the RT-S and RT-X. Every aspect feels durable and of good quality. 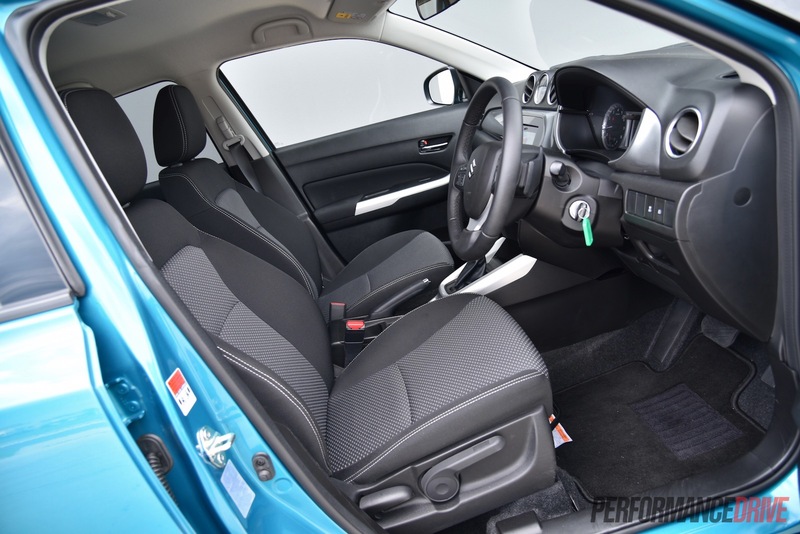 Sure, most of the interior plastics are basic but it all seems well integrated with a consistent design. Even the standard four-speaker stereo produces deep and meaningful sounds, peaking at 93.1 decibels under our usual test – the max-volume decibel reading might be quite low but it doesn’t tell much about clarity and bass. 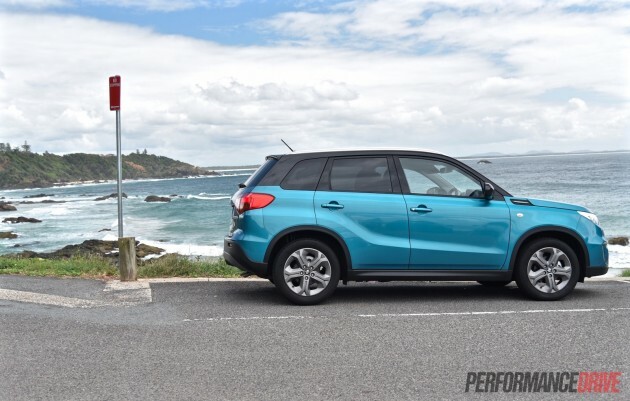 The mighty 1.6 engine only generates 86kW and 156Nm, but in RT-S two-wheel drive form the Vitara is remarkably light in weight. 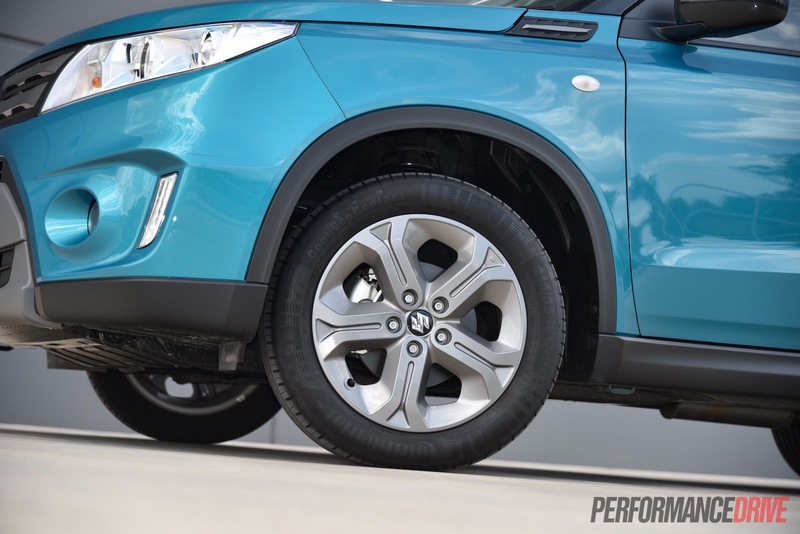 The manual version offers a kerb weight of just 1075kg, with the auto version adding 45kg. 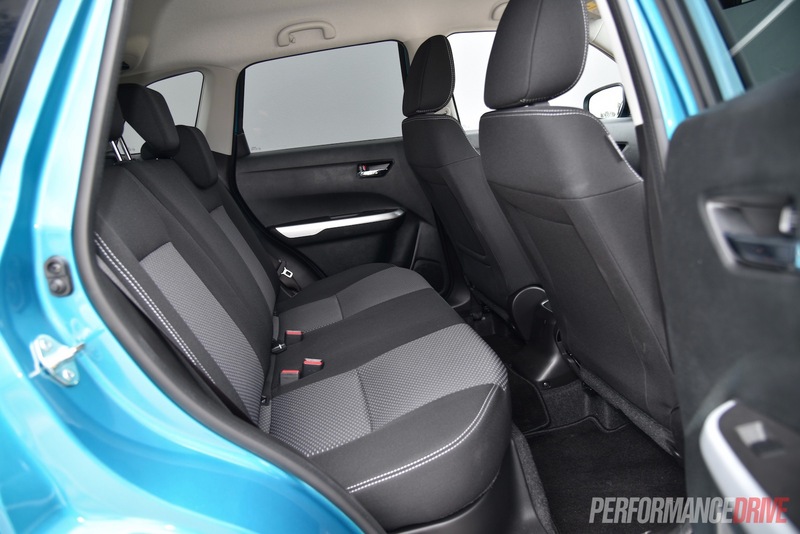 This makes it one of the lightest vehicles in the segment, and certainly lighter than our two favourites mentioned at the start; FWD Mazda CX-3 petrol (1200kg), FWD Honda HR-V (1328kg). 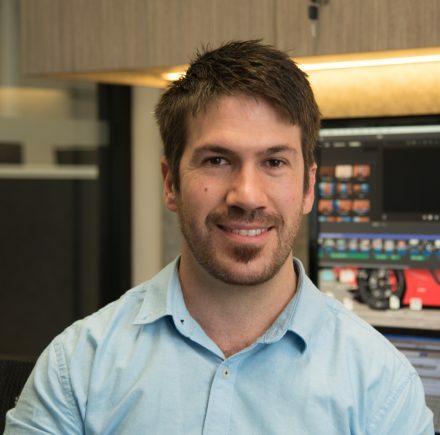 This will obviously be of particular interest to those who are considering towing a small SUV on a long trip around the country behind a camper. Lightness is not only good for towing though, it also helps with handling and agility, fuel economy, and overall performance. 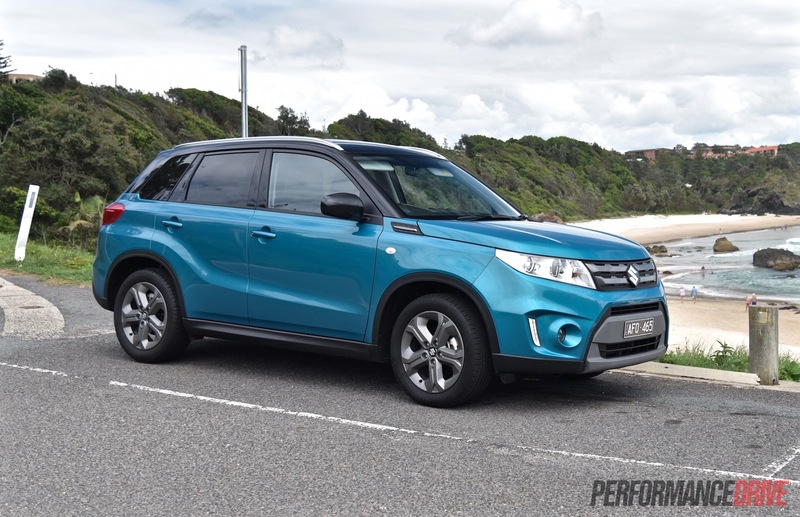 Unfortunately, the 1.6 engine, as ambitious as it might be, can’t propel the Vitara up to speed as quick as or as easy as the rivals. We timed 0-100km/h in 11.68 seconds in the auto, and a more respectable 10.97 seconds in the manual. 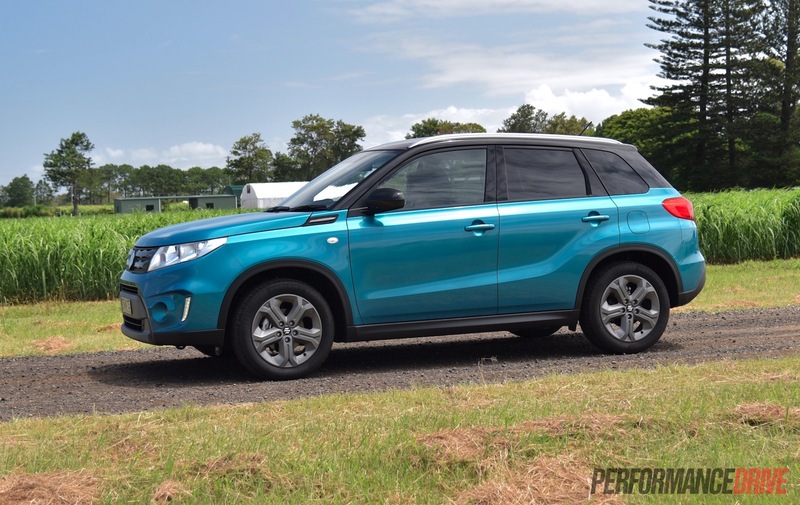 Compared with the petrol CX-3 (8.8 seconds) and Honda HR-V (9.2 seconds), the Vitara is willing but its little legs do have to work hard to keep up with the traffic. The manual is definitely the sportier drive. If you can go for the manual, we’d suggest you at least consider it. However, with only five gears it does require high revs out on the freeway. 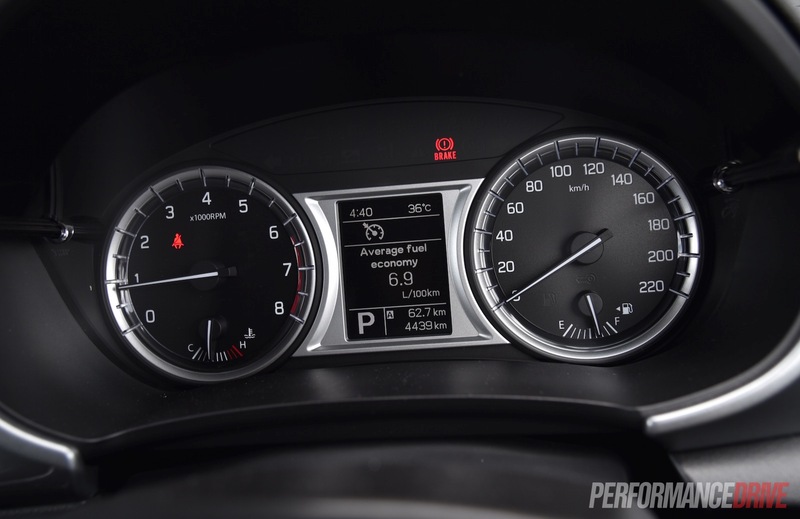 On the contrary, the six-speed auto only needs 2000rpm to maintain 100km/h. It is a relatively quick-changing auto too, with a good spread of ratios. 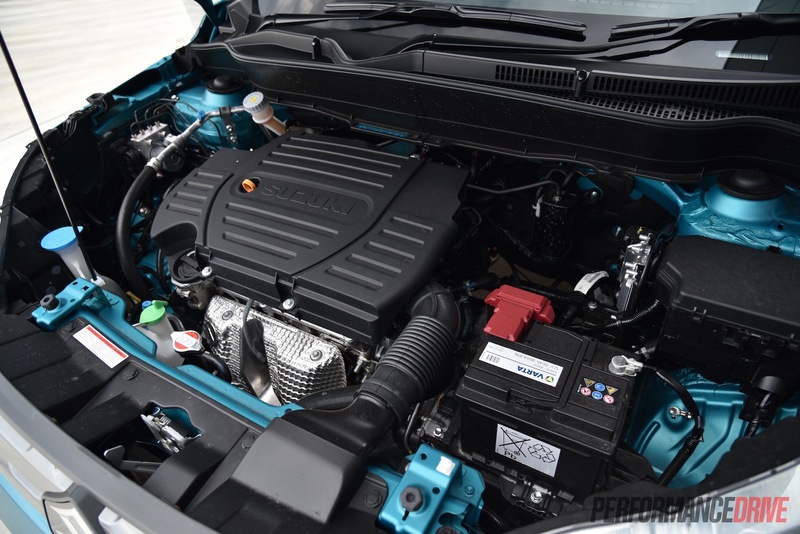 It does hunt around a bit but only because it needs to to maximise the engine’s low power. With either transmission, mid-range torque, although quite low overall, does provide enough urge for zipping around. Getting up to freeway speed requires a push and some revs, but once it’s there it is comfortably settled. It is adequate for what it is and what it’s designed for. 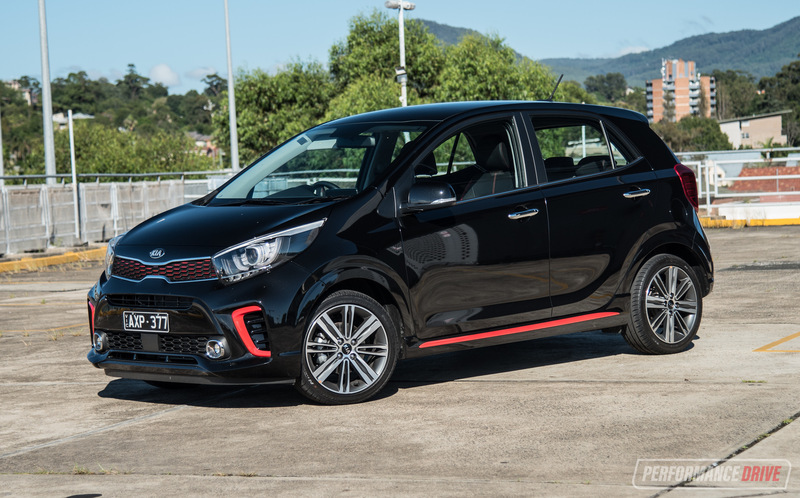 For those wanting more oomph you’ll have to wait for the 103kW turbo version to arrive a bit later in the year. 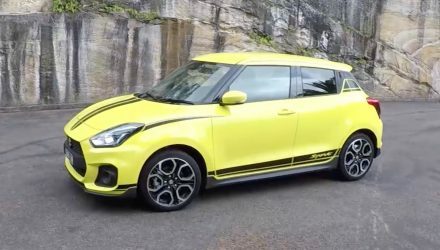 It will be offered in both FWD and 4WD forms. 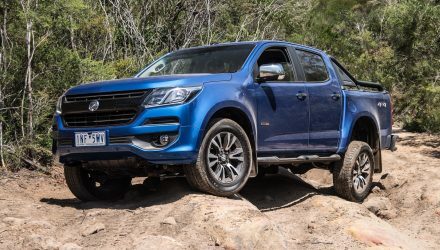 All current models, including 2WD and 4WD, offer a braked towing capacity of 1200kg (400kg unbraked). As mentioned, one of the great things about lightness is fuel economy. 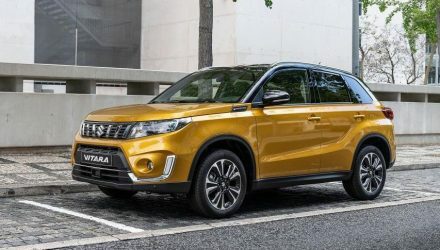 The Vitara RT-S merely sips fuel as it skips along, registering just 5.8 and 6.0L/100km on official average rates for manual and auto, respectively. On the highway we saw the auto version drop right down to 5.8L/100km. You could expect around 6.5L/100km after extended regular use in either transmission option. 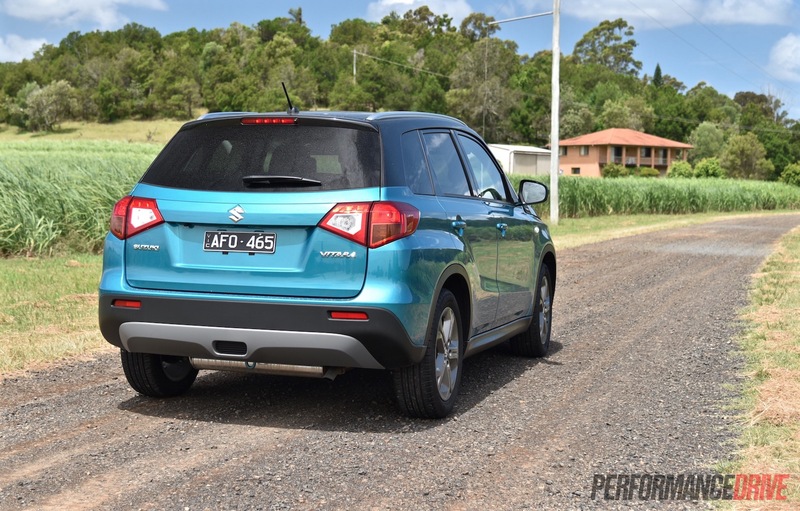 Overall, the Vitara RT-S is a fun little car. 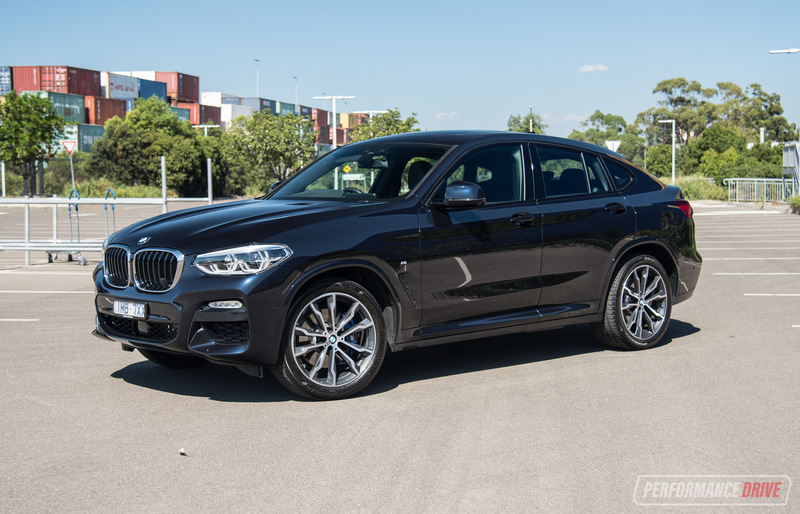 It’s friendly and easy to drive and see out of, with nimble handling. The steering is engaging enough with plenty of feedback thanks to the non-power-assisted rack and pinion setup. 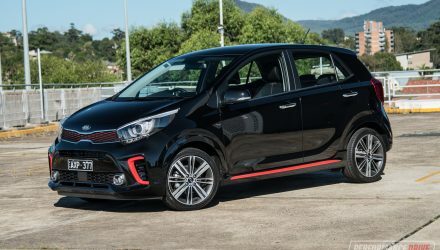 There is a bit of weight to it for a solid feel, and the 215 tyres do well to keep it all stable and relatively planted on the road. 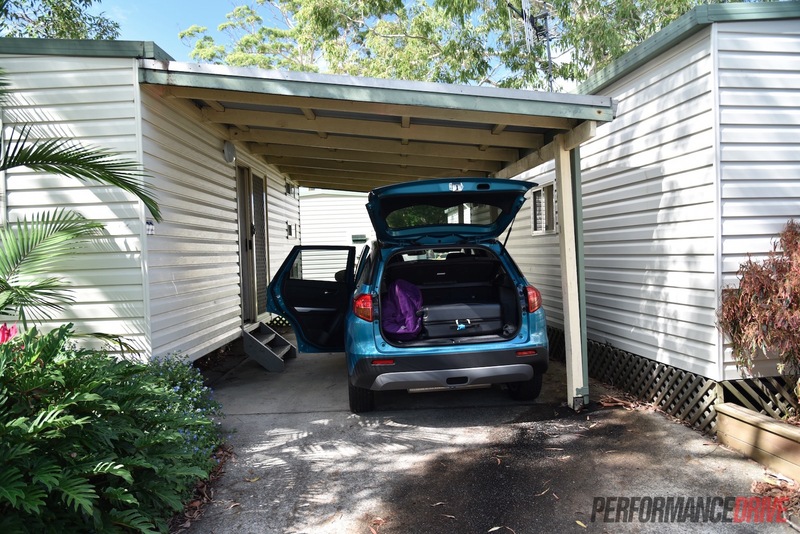 Being so small and lightweight, crosswinds do tend to push and pull the Vitara around a bit. We didn’t think it was possible to match the appeal of the Mazda CX-3 and Honda HR-V, however, the new Vitara RT-S is now one of our favourite small SUVs. It might lose some points on power and the ordinary interior materials but it more than makes up for it with outright value and packaging. You really do get a lot for your money. And it’s not just about affordability. It’s also a decent-looking product inside and out we think. It’s comfortable and practical, and most areas represent decent durability and attention to detail. 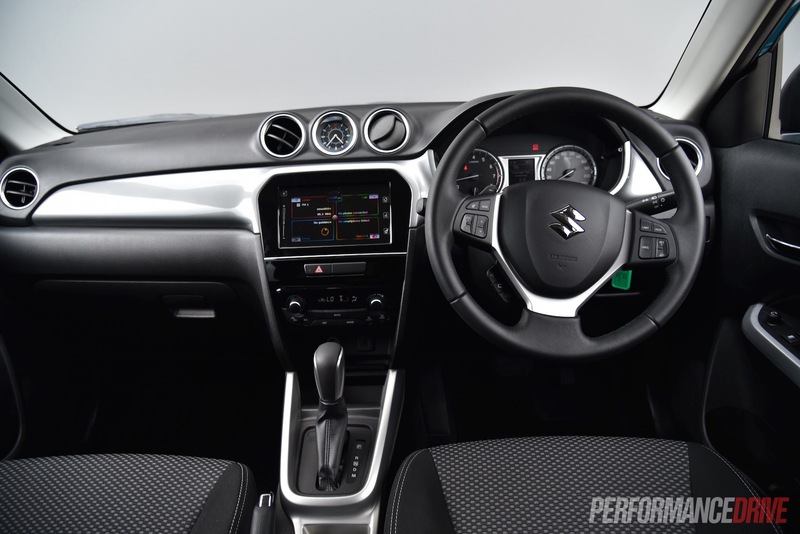 If you’re in this space of the market at the moment we strongly recommend you take a good look at the Vitara RT-S.